To municipalities of various sizes, the Ohio River is home. Numerous cities, towns, villages, and hamlets occupy the banks of the 981 miles (1579 km) from Pittsburgh, Pennsylvania to Cairo, Illinois – but this post is about only one of them. Neville, Ohio is a rural village along the Mighty Ohio in the southern part of my county (Clermont). Other than driving through it several times over the past 40 years, my history with Neville is nil. 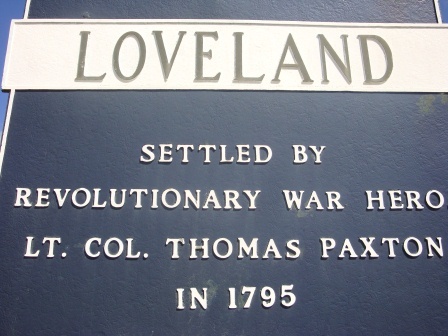 Founded in 1808 by Gen. Presley Neville, a Revolutionary War veteran. The US government established a post office there in Neville 10 years later – which is still operating today. From the war memorial, to store names, to officials, certain families have dominated its history – but that’s normal in a small town. By 1880, Neville’s commercial district was vibrant as the population grew to 445. Being along the Ohio River, Neville has battled its share of floods – especially the major floods of 1913, 1919, 1937, 1964, and 1997. The ‘97 flood the caused more than half of the population to move because, the Federal Emergency Management Agency (FEMA) bought land and demolished buildings so nobody would build again on those locations. 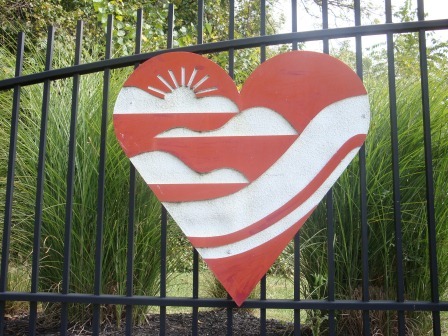 As a village, Neville depended on funding assistance from the Ohio’s Local Government Fund. In 2010, in order to balance the state’s budget, our newly elected governor slashed the fund’s existence. Besides saving the state money, the survival-of-the-fittest approach would force local governments to either streamline their expenditures to become part of the surrounding township or merge with another municipality. In the last 10 years, about 10 governments have dissolved – the majority since the 2011. Ohio Auditor’s office gave Neville’s mayor a choice: vote to dissolve or eventually face a court-ordered dissolution. Today, Neville’s population of 100 has a median income of about $31,000. No businesses exist within its boundaries … and the state of Ohio has a budget surplus. This past March 15th, voters in three more villages across Ohio faced the dissolution decision on the ballot. Somerville (Butler County) will close its doors, but Smithfield (Jefferson County) and Neville thumbed their noses at the state in order to live another day – at least until the next dissolution vote. 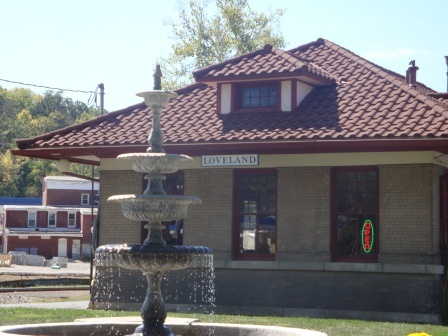 As part of Robin’s Walktober, welcome to Loveland, the town where my wife and I reside. 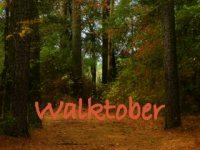 Instead of sharing our beauty fall colors, I’ve chosen to take you for a town walk of this northeastern Cincinnati suburb. Although the final debate is in progress during the publishing of this post, I decided to make it a clean sweep – thus I did not watch. Nonetheless, this post is about the information that you don’t hear. As anyone tracking the U.S. presidential campaign knows, Ohio is one of the key battleground states. As the country 17th state and our 18 electoral votes, we (unfortunately) lead the country in campaign ads. Nonetheless, with all the campaign reports from Ohio, this post is about information you may not know. Ohio is home to several halls of fames, numerous first-class museums, the best roller coaster parks, and numerous other vacation stops. While an earlier post focused on festivals in Ohio, this one is about museums. Besides, this, along with last week’s post about festivals, will help a certain Canadian and a New Yorker with their Vacation Ohio planning. Sure, you could visit Cincinnati’s Museum Center or Freedom Center, Center of Science and Industry (Columbus), United States Air Force Museum (WPAFB, near Dayton), Cleveland’s Museum of Natural History or Rock and Roll Hall of Fame, Football Hall of Fame (Canton), National Inventors Hall of Fame (Akron), and other well known museums, this post provides those stops that one may not consider and may not find in the published tour book or at Discover Ohio. Summer is approaching, which also means people are planning vacations. I know a certain Canadian and a New Yorker who are researching ideas for coming to Ohio for other reasons than seeing me. So, being a thoughtful soul, in upcoming weeks I want to offer Vacation Ohio suggestions to my friends and readers. Like any of state, Ohio has its share of festivals. Some festivals honor/feature food items as corn, walleye, perch, fish, strawberries, grapes, gourds, potatoes, melons, pumpkins, sugar maple, bratwurst, apples, sweet corn, BBQ, ice cream, maple, sauerkraut, honey, caramel, pork, and apple butter. Others offer tributes to various heritages as French, Germans, Greeks, Irish, Italians, Polish, and Swiss. Now throw in other odds-and-ends as arts, tobacco, carnations, rivers, dams, covered bridges, antiques, sternwheelers, baskets, Ohio beer, wine, blues, jazz, quilts, films, dogwoods, Celtic music, railroads, hot air balloons, chalk art, leaves, and scarecrows. On the other hand, here are a few that may interest adventure seekers of all ages. I listed them in chronological order, and one could combine them together for an extraordinary weekend. Most of these have a web site for more information. Welcome to the Buckeye State! Plus here’s are links to Ohio Tourism, Ohio Fest, and the Ohio Festival and Events Association. 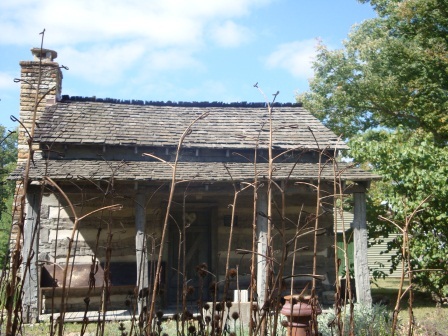 Since readers are enthralled with learning about Ohio, here’s another list of firsts for the Buckeye state to go along with this earlier post. For even more information about the Buckeye state to help anyone prepare to be a Jeopardy contestant, see Categories > Ohio in the sidebar. This past spring the mind behind The Karmic Boomerang contact me, along with other Ohioans, to provide information about Ohio for his feature. Regretfully, I was knee-deep in a project and didn’t respond. Good karma suggests that I write a feature supporting his efforts; not duplicating, but adding too his original post. 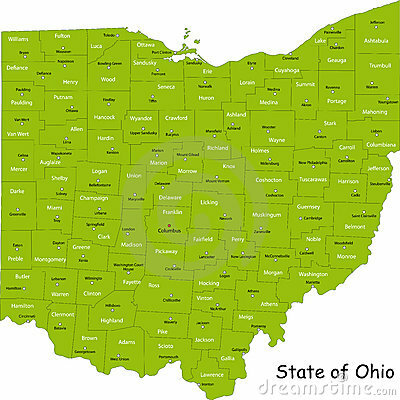 Ohio has 8 FCS football programs, 13 Division I basketball programs, and 3 college hockey teams. Big school men’s NCAA national championship teams include Ohio State (football*, baseball, basketball, fencing, golf, gymnastics, outdoor track), Cincinnati (basketball), and Bowling Green (hockey). * The NCAA does not issue a national championship for FCS/D1 football. See list of champions for confirmation, but semi-recognizes the BCS champions. The University of Cincinnati had 5 consecutive trips to the Final 4, which hasn’t been bested by many. Special distinction to Kenyon for winning every D-III men’s swimming and diving championship since 1980; that’s 29 in a row and counting! The NFL Portsmouth Spartans became the Detroit Lions. Paul Brown selected orange and brown for the Cleveland Browns after seeing the colors at Bowling Green. Professional football’s Canton Bulldogs only played 6 seasons. Bevo Francis, scoring legend at Rio Grande College (yes, in Ohio, not Texas), captivated the nation by averaging 48.3 ppg in 1953. If you never heard of Bevo, here’s his ESPN Sports Century biography. Entertainers Bob Hope, Clark Gable, Dean Martin, Paul Newman, and Steven Spielberg have Ohio roots. CNN news anchors are from Ohio: Carol Costello, Robin Meede, and Christy Paul. Robin Meade was a Miss Ohio (’92) and Christy Paul was the 3rd runner up the following year. North Carolina and Ohio both claim to be first in flight. The Wright Brothers first successful flight was in North Carolina after doing the majority of work in Ohio. Ohio is the corporate home to more than a few names you may know: Procter & Gamble, Society/Key Bank, 5th/3rd Bank, Macy’s, Iams, Kroger, Mead, LensCrafters, Longaberger, Rubbermade, Goodyear, Wendy’s, Bob Evans Farms, Sherwin-Williams, Cooper Tires, Smuckers, Mac Tools, Parker-Hannifin, Battelle, Cintas, and Bobby Rahal Racing to name a few. Pomeroy is listed in Ripley’s Believe It or Not as the only town of its size without a crossroad. 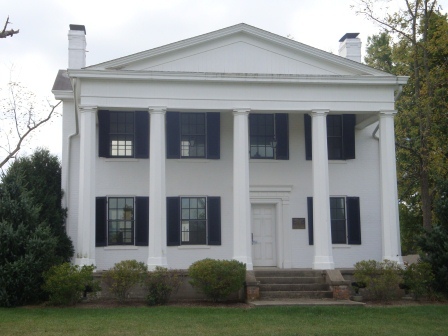 Chillicothe was the first state capital. 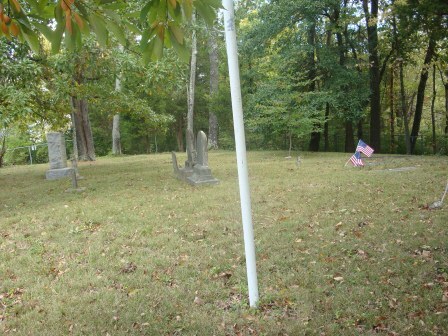 Go figure – Centerburg (Knox County) is the geographic center. South Point is the most southern spot, Middleport is half way between Pittsburgh and Cincinnati, but Northfield isn’t the most-northern field. Given its most extreme points, Ohio is 25 miles wider than its length. Of Ohio’s 88 counties, Stark County borders the most counties: 8. Lancaster anyone? Ohio has LANC-aster, but lan-CASTER is located elsewhere. The longest bar in the world is at the Beer Barrel Salon in Put-in-Bay. Ohio has festivals celebrating sugar maple, dogwoods, spring plowing, ribs, hot air balloons, strawberries, sweet corn, pumpkins, zucchini, twins, melons, marigolds, tobacco, popcorn, bratwurst, grapes, kites, sternwheelers, ice cream, apples, apple butter, apple dumplings, sauerkraut, dulcimers, turkeys, fish, and buzzards; as well as the Irish, Germans, Italians, Appalachians, Pioneers, Swiss, and Farmers.